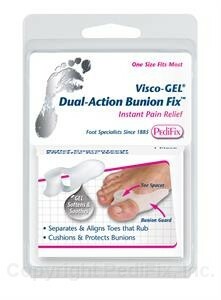 Two-way comfort: soft Gel Spacer separates and aligns crooked, overlapping first and second toes that rub, while the attached Bunion Guard cushions and protects the sore bunion joint from shoe pressure and friction. Washable. Reusable. Durable. Fits either left or right foot. 1 per pack.